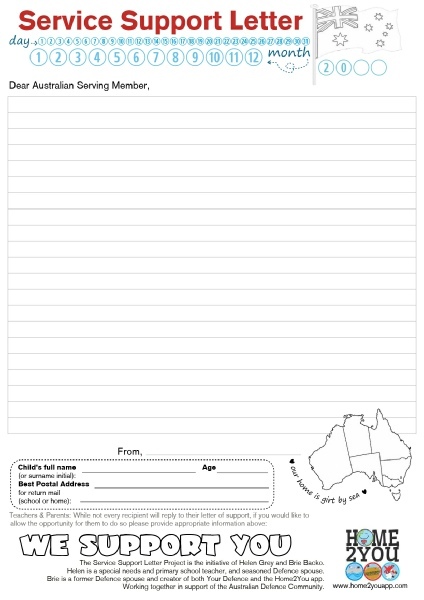 Service Support Letters are pre-printed worksheets specially designed for Australian school-aged children to write letters of support to Australian Defence Force Serving members who are away from home on overseas operations. 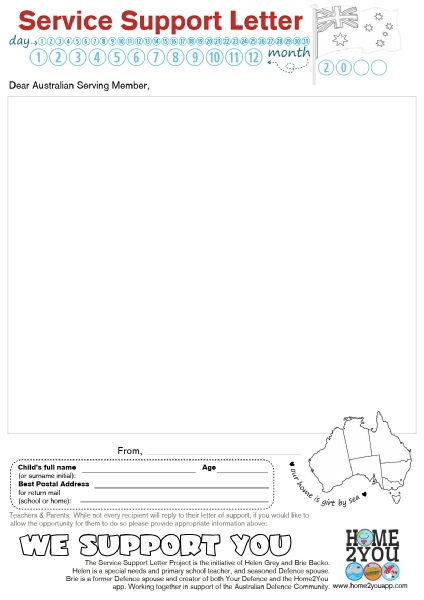 The children's worksheets have been designed with a simple format and layout to allow the children to personalise the sheets with their own colouring-in, tracing, drawing and writing. 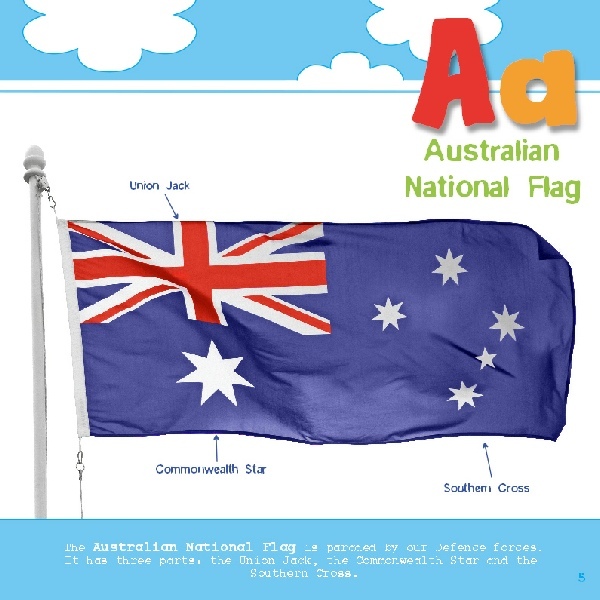 Elements such as the map of Australia allow further in-class discussion of official State colours as well as elements and colours of the Australian Flag. 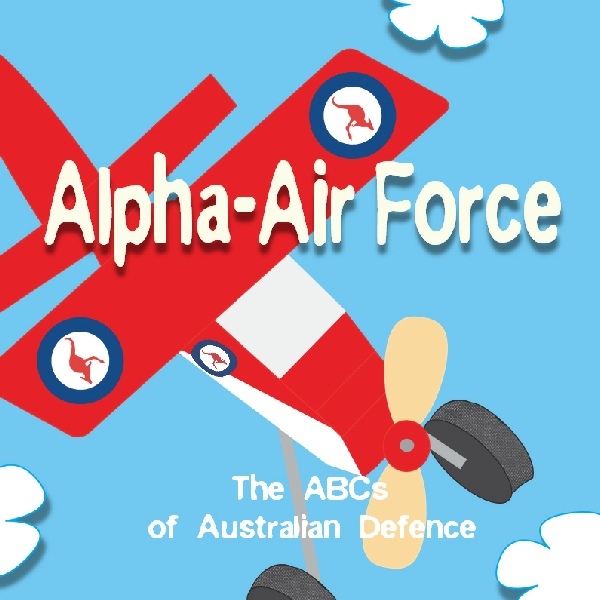 Involving Australian school children in letter writing to our troops serving overseas serves both to educate and to engage youth in matters of the modern Australian Defence Force. Letter writing provides a simple mechanism for contributing to the positive morale and goodwill of all deployed Australian military members. 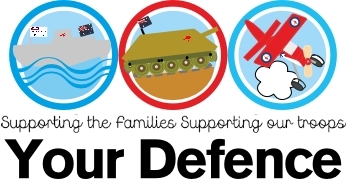 Following Seven years of providing the Australian Defence family community practical support materiel (supplies), the Your Defence Support Store has now closed. It is with great thanks to the ADF family community for your support of the Support Store component as part of the greater Your Defence initiative. 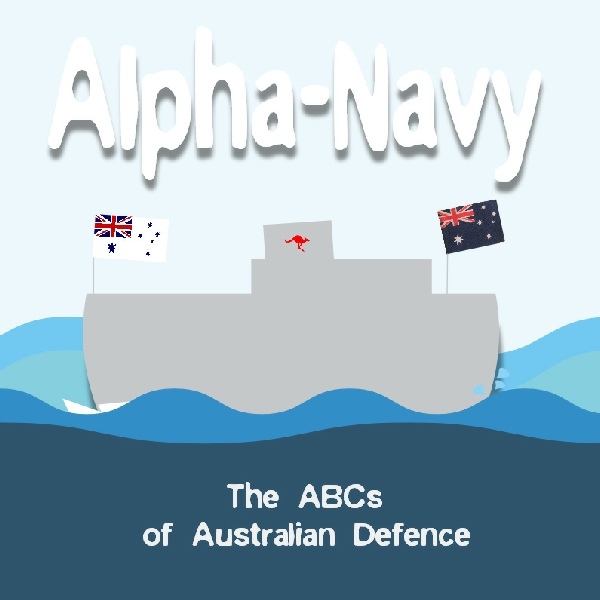 The purpose of Your Defence was always to help children separated from mum or dad due to operational service by providing accessible practical resources to keep families connected. 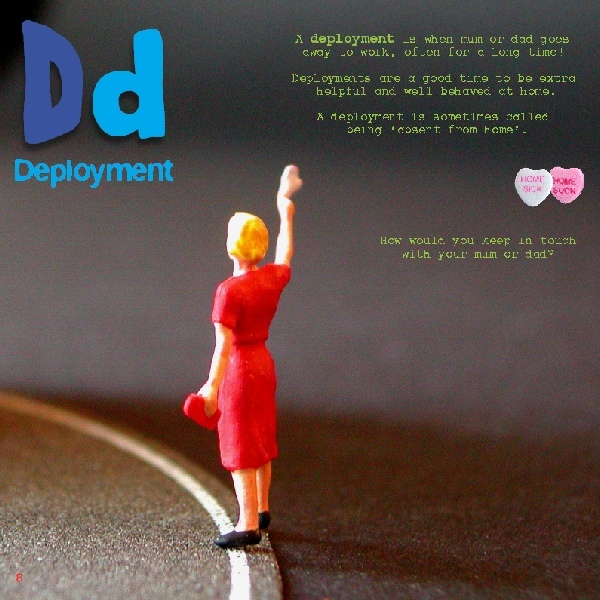 With this purpose in mind, we are now focusing on the Home2You app, the Home2You Story Book, and the Home2You ‘My Story’ Books as primary tools for military families to implement as part of their fundamental deployment routines. 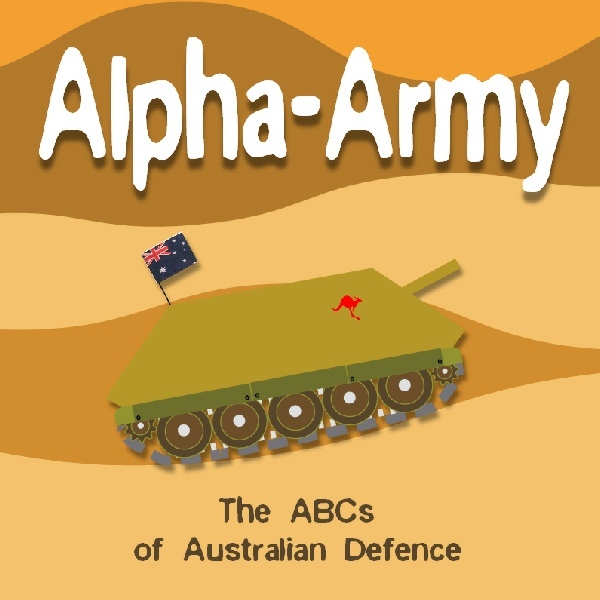 Personalised Little and Bigger-folk letter printables will return shortly following many requests from the community, and hard copies of the Alpha-Books are available for purchase exclusively via the Australian War Memorial Gift Store. 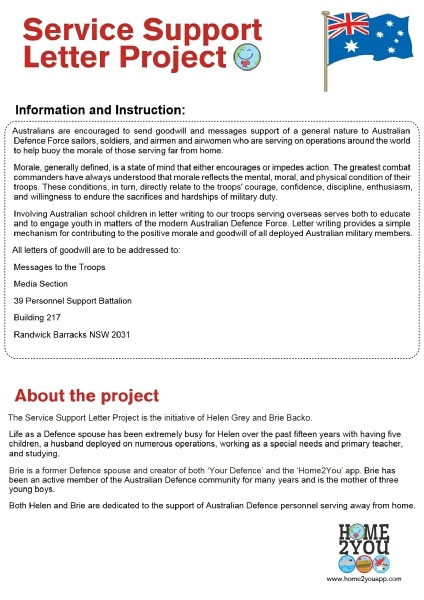 The Your Defence Letter Writing to the Troops project for school children is also still running. 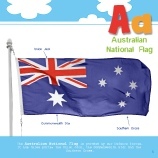 The project features pre-printed templates in PDF format for educators to print and use. 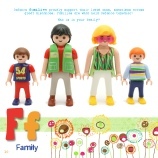 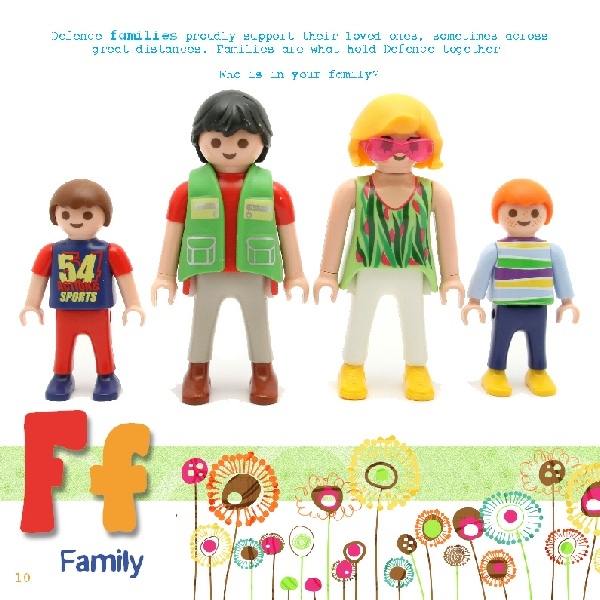 The print ready PDF files are free of charge and easily downloadable by clicking the big orange button located above. 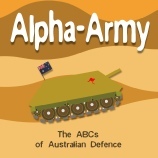 Further info on Your Defence here.